Did you know that we are happy to special order most products available from any of our current manufacturers for you? Just shoot an email to [email protected] letting us know what you are looking for! Once your order arrives, you will be notified that it is ready for purchase from this page :) Please note that certain terms and conditions may apply. 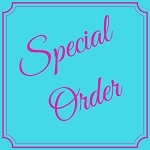 Special Order - Christine M.
Special Order - Julie B.